Dundalk's Caolan Rafferty moved another step closer to his maiden championship victory when he beat Kilkenny's Mark Power 5 and 4 in the semi-finals of the Pierse Motors Volkswagen sponsored South of Ireland Championship at Lahinch. The 25-year-old will meet fellow international Rowan Lester from Hermitage after the 22-year old Dubliner beat Forrest Little's Jack McDonnell 3 and 2 in the other semi-final. "I battled hard and made a few nice birdies at the start of the back nine but whenever I was in for birdie he would make one as well," said Power (18). "In fairness, Caolan has been knocking on the door for a long time. He's very steady and these conditions will suit him down to the ground. It's not that breezy and that's about as good as you can expect around here. "He just played very well and I couldn't make enough birdies to put him under real pressure. "I got a bad kick in the front right bunker at the second and got a funny lie, skulled it out the back and handed him that one. He made a good putt on three and I was two down. Then he made another good birdie on five and I found myself four down after five. "I won six with a par and birdied seven and felt like I was getting back at him but he won eight and nine to go four up again. I birdied 11 and 12 but he just wasn't going away and he birdied 13, where I had an awkward lie and couldn't get anything at it and he went four up. "I had a good week and it's disappointing but it will be good for my world ranking at least and I now have the Boys Home Internationals and the Boys Amateur Championship in Royal Portrush and Portstewart to look forward to." 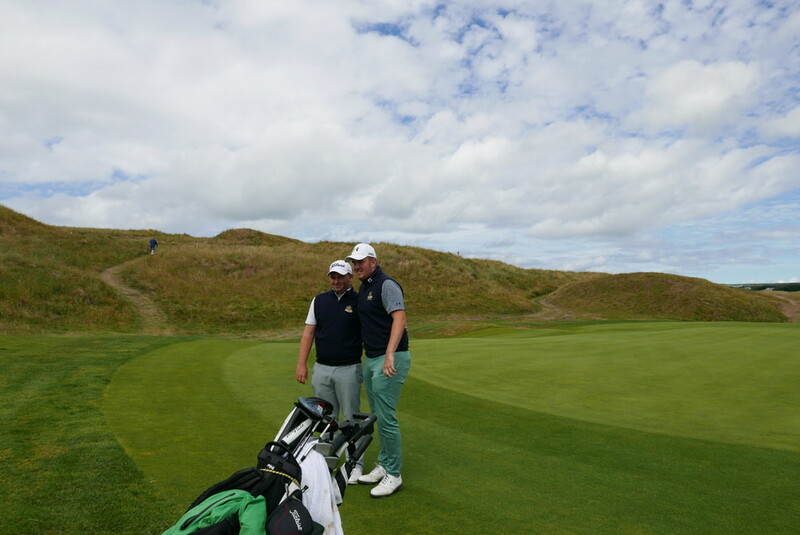 Rafferty closed out the match with a win in par at the 14th, where Power three-putted pressing for a birdie and now faces Lester, who is hoping now to go one better than in 2016 when he lost in the final to Portmarnock's Conor Purcell. The Dubliner, who is about to start the third year of a golf scholarship at Texas Wesleyan University in Fort Worth, was too steady for McDonnell (23) in his semi-final. "It was a great week," said McDonnell (23), a graduate of the Maynooth University. "I knew it would be tough against Rowan and I could have done with a bit of wind out there because he is so solid. "He birdied the eighth and I was one down through nine but I missed a short birdie putt to get back to level after 11 and he then birdied the next two to be two up and then I pushed too hard. "He won the 14th to go three up and while I had another opportunity on the 15th, I didn't take it and it was all over on the 16th. "It's my best week in a championship so I can't wait for the AIG Irish Close at The European Club now. It just love the toughness of the course. It suits me." Caolan Rafferty (Dundalk) bt Mark Power (Kilkenny) 5/4.